In an attempt to bring more authentic Vietnamese food to New York, owners Tuan and Huy Bui have opened this small space designed to look like a street alley in Saigon. It comes complete with a mobile food cart dispensing banh mi sandwiches, including fillings such as crispy roasted pork with pickled carrots, daikon radish, cilantro and aioli. 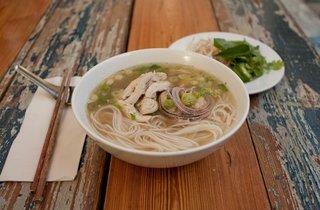 The restaurant also specializes in pho: chicken or beef broths with rice noodles, bean sprouts, Thai basil and lime. I love An Choi. My most recent experience was on a rainy night and it did NOT disappoint. It can be a little bit tight while waiting or even sitting. For the best experience, visitors should really try the half/half combo. 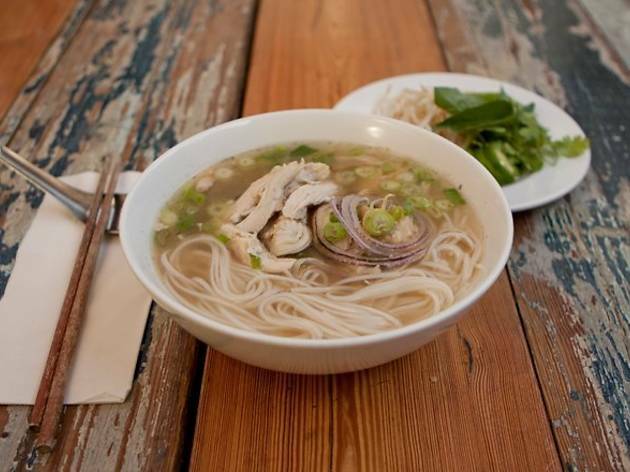 With the beef noodle soup and a catfish banh mi (including a fried egg), it's the place to go for some authentic and delicious Vietnamese food. The cocktails are also delicious. An Choi is one of my favorite places to eat at, period. Every single dish is absolutely delicious, they have yummy wine and beer (yummy wine at an asian spot? not the norm! ), really cool vibe, you generally don't have to wait long for a table, and they play the ebst music! Bahn Mi - some of the best bahn mi EVER. My favorite is the catfish, with a fried egg. Don't sleep on An Choi - you will not be disappointed! !